Concrete flooring has become a staple in every workspace. Concrete can withstand a lot, without cracking under pressure. After all, that’s why it’s often used for garages and utility areas, so it can hold cars, forklifts and other heavy machinery. This same durability holds up against high heels, furniture, and pets. With durability comes reliability. You want your workspace to be a working space, which means reliability is key. Concrete floors can take on any weather and hold up against hard impacts. So no matter what project you have in front of you, you’ll have a floor ready to help you get the job done. In order to keep concrete looking its best, it should be sealed every 3-9 months. It’s not easy to scratch or crack, so you’re looking at a low maintenance floor that won’t make a ton of work for you. It requires very little upkeep, needing only a mopping every week or so to keep it looking fresh and clean. Unlike other flooring which has to be redone every few years, a properly maintained concrete floor can last up to decades. The return on investment is exponential. There is certainly a design to fit your needs. Interested in hearing more about the advantages of concrete flooring? Speak with a professional and determine if it’s the right course of action for you. 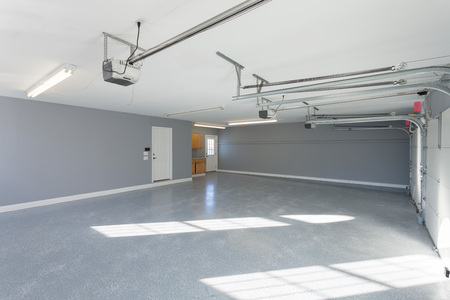 Give us a call at 612-388-1945 to learn more about installing concrete flooring in your garage today!